The Knesset passed the “Basic Law: Israel as the Nation-State of the Jewish People” ten years after it was first introduced on the Israeli parliament’s agenda. The law underwent several changes marked by controversies that would surface then disappear, preventing its enactment, then, in early July, Benjamin Netanyahu resolved to get the law passed once and for all (second and third reading) in the Knesset before summer recess on the eve of Jewish holidays. Indeed, since Netanyahu announced in early July his insistence on passing the law, it was adopted on 19/7/2018 by a majority of 62 Knesset members (55 voted against and 2 abstained), as a basic law of a constitutional nature. This law carries many legal, political and ideological implications for Israeli reality, on the one hand, and for the Israeli vision for the status of the Palestinians within the Green Line, and the Palestinian issue in general, on the other hand. In this paper, we will attempt to analyze the dimensions of the law through the following themes, while emphasizing that the law needs further study and research. The law also contained other clauses that seek to undermine the status of Arabic as an official language in the land, a status that the Arabic language had maintained since the British Mandate period in Palestine. The law states that “The Arabic language has a special status in the State” but no longer an official one. The various iterations of the nation state law, while maintaining the law’s central spirit, underwent several amendments every time a right-wing member of the Knesset would re-submit the bill, until the current version was adopted. 1. The Land of Israel is the historical homeland of the Jewish people, in which the State of Israel was established. 2. The State of Israel is the nation state of the Jewish people, in which it realizes its natural, cultural, religious and historical right to self-determination. 3. The exercise of the right to national self-determination in the State of Israel is unique to the Jewish people. 4. Jerusalem, complete and united, is the capital of Israel. 5. Hebrew is the State language. 6. The Arabic language has a special status in the State. 7. The State shall be open for Jewish immigration, and for the ingathering of the Exiles. 8. The state shall strive to ensure the safety of members of the Jewish People and of its citizens, who are in trouble and in captivity, due to their Jewishness or due to their citizenship. 9. The State views the development of Jewish settlement as a national value, and shall act to encourage and promote its establishment and strengthening. These are the most important clauses of the law, which has undergone many amendments over a period of ten years until it reached the present formulation. The government was aiming to enact a more extreme law, with stronger nationalist tendencies, but because of contradictions in the government itself rather than with its opponents, this compromise formula was reached. Reading the law and the final version that was passed reveals the lack of any of the provisions that the opposition wanted to introduce. This is the Israeli opposition and not the Palestinian one, which we will tackle in the next section. Israeli parties did not oppose the law in principle, but have expressed reservations on some of its provisions, or because they believed that certain items are necessary and must be included. 1. The absence of any reference to equality in the law: The opposition claimed that the law does not refer to the equality of citizens, rather it discriminates between them, which is in controversy to the “Declaration of Independence of Israel.” The opposition believes that it is possible to legislate a nation state law that enshrines the exclusivity of the self-determination of the Jewish people while emphasizing the principle of equality among citizens. 2. The absence of democracy: The opposition points out that the law does not mention that the political system in Israel is democratic. Therefore, it undermines the balance present in other basic laws between the Jewish character of the state and its democratic character, by granting privilege and supremacy to the Jewish character. To counter this claim, the government had struck off a clause in the draft law, which had asserted that if the Israeli judiciary faced an issue on which civil law, civil legislations or previous judicial decisions could not weigh, it could resort to Jewish religious law to adjudicate the case. Of course, this item has been completely removed to adjust the religious aspect of the law. 3. The abolition of the official status of the Arabic language: The opposition here was based on the consideration that an official status of the Arabic language does not mean recognition of national rights of the Arabs in Israel, and would not change the exclusivity of self-determination to the Jews in Israel. The opposition considered the abolition was due to the hostility for Arabic speakers, and called instead for maintaining the status of the Arabic language. What does the passing of the nation state law mean for the Israeli scene? The law reflects the shifts taking place in the Israeli scene, the triumph of the settlements polity over the state polity, and also the dominance of the religious and populist right. The latter has long implemented neoliberal economic policies that have improved the economy in recent decades, aided by the Israeli lefts abandoning several left-wing economy principles since the mid-1980s. These policies shrank the values of solidarity, social cohesion, and produced economic inequality in Israeli society. The populist right represented by Netanyahu rose to prominence and succeeded in building a Jewish—rather than an Israeli—identity, as a result of excluding the others and inciting against them, especially Palestinians inside the Green line, and by shrinking the democratic channels to challenge the Jewish character of the state within the bounds of Israeli citizenship. Since the start of his most recent term in office, Netanyahu put the Palestinians inside the Green Line at the center of his policy and discourse, in order to introduce a new “enemy” for the his politics of identity and race that have driven his policies throughout his political career. Palestinians in Israel have been strongly present in recent years in Netanyahu’s fear mongering rhetoric. The right in Israel and its leaders, especially Benjamin Netanyahu, have persistently pursued, with and without occasion, a policy of invoking all kinds of events and excuses to incite against Palestinians in Israel. Thus, the law of Israel as the Nation-State of the Jewish People now defines specifically the limits and essence of citizenship and its limited ability to change the status of non-Jews, especially Palestinians in the Jewish state. The new law in other words establishes the new republic of the populist right, just like when “Declaration of Independence of Israel” established the State of Israel under the leadership of David Ben-Gurion and his socialist camp. In addition, the nation-state law is contradictory to the Oslo Accords, which triggered the transition from the settler-colonial mindset to a statist thinking. Indeed, Israel had started moving towards resolving the conflict through a negotiated settlement, while taking advantage of the balance of power tipped in its favor to impose an unfair settlement on the Palestinians. It promoted state building while defining borders and citizenship (e.g., the enactment of two Basic Laws: “Human Dignity and Liberty,” and “Freedom of Occupation” in the early 1990s). It also attempted to regulate the Jewish-democratic character of the state by codifying it and adapting it theoretically and politically as a new reality, since the early 1990s, too. The nation-state law represents a break from the logic of the state and marks the beginning of a legal transition to settler-colonial logic, captured by the gist of the law. The Zionist project did not end in 1948, but continues, where Israeli statehood is only an instrument in its fulfillment rather than its final purpose. Therefore, the debate on the nation-state law is not just about the rights of the Palestinians in Israel or the future of the Palestinian issue, but also about the contradiction between those who represent the notion of statehood and those who represent Zionist settler-colonialism. The nation-state law bears major implications for Palestinians in the interior and in the Palestinian territories in 1967. It abolishes, first and foremost, the principle of self-determination for Palestinians within the Green Line, even in the minimal and limited interpretations of the concept of self-determination, which includes recognizing the collective rights of the Palestinians within the Green line. Thus, the law abolishes their political existence as a national group and treats them as individuals; not only practically speaking, but also constitutionally. Since Netanyahu’s return to the office of prime minister, his government has initiated a vigorous campaign of legislation and political practices in all areas (especially education, culture, land, and planning) for the sole purpose of “repressing the political aspirations of the Arab community in Israel,” as Aluf Benn, political analyst and current editor-in-chief of Haaretz, puts it. Just as Netanyahu aims to eliminate the Palestinian national movement, he seeks to eliminate the political aspirations of Palestinian society in Israel by striking every expression of Palestinian national identity. The culmination of this process was the outlawing of the Islamic movement headed by Sheikh Raed Salah and the prosecution and detention of its members and leaders. First: It reduces the potential of citizenship to change the status of Palestinians within the Green Line. Since the 1990s, as a result of the economic, constitutional and political transformations undergone by Israel, the Palestinians have taken the advantages of the citizenship system to its maximum extent in the struggle against exclusionary and discriminatory policies against them. They improved their collective rights even when the state or the judiciary did not intend for that to happen. Second: The abolition of the official character of the Arabic language and undermining the cultural value of the language in education and the public sphere is not a cosmetic measure. The status of the Arabic language in the Israeli public sphere, despite its official character, was never equal to the Hebrew language, but the abolition of its official character, although it was not present enough on the ground, is a blow to the collective rights of the Palestinians recognized by the state since the time of the British Mandate. It seeks to remove any collective national status for the Palestinians in Israel, beginning with linguistic rights. Theoretically, recognition of Arabic as an official language means the recognition of bilingualism in the state, which implies that there are two distinct national groups within the borders of a particular state. For example, Canada is a multicultural state based specifically on bilingualism, so the Jewish nation-state law seeks to abolish even this theoretical dimension. Third: The nation-state law is the basis for attacking the judicial struggle of the Palestinians regarding their status in cases of a collective nature. For example, before the new law, it was possible to resort to the judiciary to impose the Arabic language on the public sphere, including public transport, government institutions, and the education system. This law now eliminates this possibility. Fourth: The law conforms to Israeli policies seeking to Judaize the Palestinian space through its explicit declaration that the state encourages and supports Jewish settlement in the state. This is in line with the settler-colonial mindset we mentioned earlier. The word “Judaization” in Galilee and Negev is no longer an inappropriate word in the current Israeli political dictionary. In the Israeli discourse after the 1976 Land Day protests, this term had been replaced with terms such as: the development of the Galilee and the distribution of the population into different parts of the country. Although the law does not expressly refer to the prohibition of Arabs to live anywhere in the state, in practice, it declares that the state will establish Jewish-only towns only, and this leads to the reduction and strangulation of the Palestinian space, while preventing Palestinians from living elsewhere, if the law is taken towards its most profound interpretation. The Jewish nation-state law carries great implications for the Israeli and Palestinian scenes. Apparently, the Israeli government does not intend to introduce any amendment to the law despite protests against it from various sources, and despite Druze protests against the law, who consider, for example, their service in the army as a lever of Druze rights. Indeed, Netanyahu has announced that he would not introduce any amendment to the law, because for him this law represents a natural historical process in the Zionist project. Herzl had laid down the idea of the Jewish state, then Ben Gurion declared statehood through the Declaration of Independence, while Netanyahu entrenched this reality through the nation-state law. This law is also consistent with the Israeli demand for the Palestinians to recognize Israel as a “Jewish state” in any future peace settlement, which means recognizing the Zionist narrative and its “rights” in Palestine. - Dr. Mohanad Mustafa the General Director of the Mada al-Carmel in Haifa, and a university lecturer. He holds a PhD from the Faculty of Political Science at the University of Haifa. He has published many books, researches and academic studies in Arabic, English and Hebrew, as well as intellectual and political articles. "Regardless of their political position as supporters or opponents of the regime," the decision read. The court's ruling was given during the hearing of a 44-year-old Eritrean citizen who appealed the Population and Immigration Authority's decision not to grant him a refugee status. 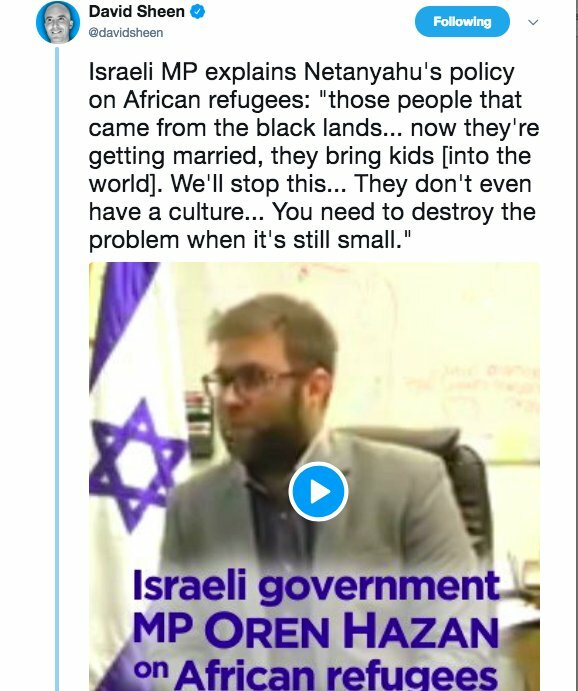 The appellant infiltrated Israel in 2009 after he deserted the Eritrean army and asked to be recognized as a refugee fleeing persecution by the authorities in his country. The Immigration Authority rejected his request about a year ago on the grounds that "desertion or evasion of military service does not constitute grounds for political persecution and therefore does not constitute grounds for recognizing deserters as refugees." The judge based his decision on the "the raging crime committed by infiltrators on the streets and the helplessness of the judicial system in bringing them to face criminal charges." "The solutions proposed by the state so far (Saharonim detention facility, expelling Eritreans to a third country, the Deposit Law, and the UN proposition) have failed," the judge added. As for infiltrators from Sudan, the judge said he has no intention of discussing their status" in the framework of this hearing." The judge also stated that the courts ruling is reinforced by a change in the political-regional circumstances (Eritrea-Ethiopia peace deal signed last month), the reduction of the length of the Eritrean national service to 18 months, and the ruling of the Federal Court of Switzerland (issued on July 10) which stated that approving the expulsion of Eritreans infiltrators back to their country. According to the judge, in light of reports regarding the peace agreement between Eritrea and Ethiopia, and the new restriction on the Eritrean national service, now "the door is open and the time is ripe for a change in the Israeli policy. The government should order the expulsion of Eritreans back to their country, as long as the state denied their asylum application." The judge ruled that the Refugee Convention's clauses do not apply to this case, since the asylum seeker failed to submit evidence showing otherwise. However, the Population and Migration Authority emphasized that the appellant will continue to benefit from the temporary group protection given to all Eritrean citizens residing in Israel, including army and national service deserters, in accordance with the "non-refoulement" principle and in light of the decision to recognize Eritrea as a country in a state of crisis. Yonathan Yaakobovich, director of activities at the Israeli Immigration Policy Center, praised the decision and said that "this is an important ruling that confirms what we have known for years—there is no justification for their stay in Israel, and most of the infiltrators can, in fact, return to their country…one can only hope that this ruling will restore some common sense to Israel's asylum system." Human rights organizations, including the Hotline for Refugees and Migrants and the Association for Civil Rights in Israel, strongly criticized the decision. "The judge decided to share his own political doctrine and launch an unprecedented attack on the rulings of the Supreme Court and the government," they said. "The judge's decisions and recommendations are based on false reports and unverified theories, since the Eritrean regime has yet to address recent reports about the new restriction posed on the length of the army service. "Forced recruitment is still taking place in Eritrea, as the Swiss embassy in Israel explained, contrary to reports; Switzerland does not expel Eritreans to their homeland. "In addition, representatives of the Ministry of Foreign Affairs, the Ministry of Justice, and the National Security Council made it clear that Israel cannot deport Eritreans to their homeland since their life are in danger in Eritrea," the organizations concluded. A member of the Tel Aviv Residents Center, Shefi Paz said in response to the ruling: "the way I see it, the judge is the boy who came out against the lies and political correctness and said that the emperor has no clothes, for many years we have been saying exactly that—send them home…On August 30, on the anniversary of the Prime Minister's promises to the residents of South Tel Aviv and the citizens of the state, we will hold a large demonstration at the same spot." Day after protesters wave Palestinian flag in Tel Aviv's Rabin square at mass demonstration against recently-passed law, PM says events prove 'it is clearer than ever' why legislation is necessary; minister says 'Rabin would be rolling in his grave' at PLO flags in square named after him. Tens of thousands of Arabs and Jews flooded Rabin Square in Tel Aviv to protest the law while chanting "With spirit, with blood we shall redeem you, Palestine". Simultaneously, dozens waved Palestinian flags in violation of a ban on the flying of any flags. “Last night we received cogent testimony of the opposition to the existence of the State of Israel and the urgency of the Nation-State Law,” Netanyahu said at a weekly Cabinet meeting, a day after he published a video on Twitter of the Palestinian flags and chants at the rally, accompanied by similar words. “Yesterday we saw PLO flags in the heart of Tel Aviv. 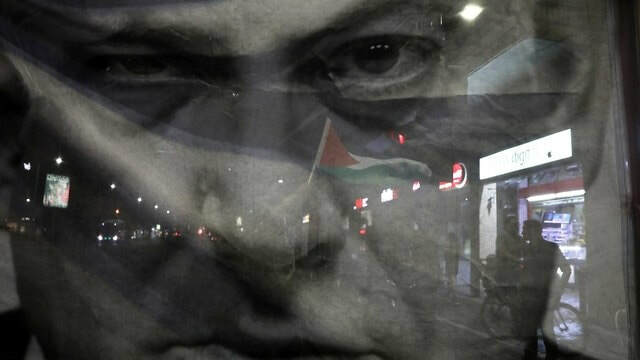 We heard the calls: 'With blood and fire we will redeem Palestine.' Many of the demonstrators want to abrogate the Law of Return, cancel the national anthem, fold up our flag and cancel Israel as the national state of the Jewish people and turn it—as their spokespersons said—into an Israeli-Palestinian state, and others say: A state of all its citizens,” the prime minister said in his opening remarks. “It is for precisely this that we passed the Nation-State Law. We are proud of our state, our flag and our national anthem. Israel is a Jewish and democratic state. The individual rights of its citizens are anchored very well in the basic laws and other laws. Now it is clearer than ever that the Nation-State Law is also necessary,” he said. “It is necessary in order to ensure the future of the State of Israel as the national state of the Jewish people. We passed this law and we will uphold it," Netanyahu concluded his remarks. Prior to the ministerial meeting, a host of top government officials declared their support for the law, while slamming the law’s opponents on the Left. Justice Minister Ayelet Shaked from the Bayit Yehudi party also berated the Left while extolling the virtues of the Nation-State Law. “The Nation-State Law is correct and the Zionist Left should have supported it in the phrasing with which it was passed. PLO flags in Rabin Square last night proves that this is not a matter of equal civil rights because they clearly exist. This is about equal nationality and that will never be,” Shaked said. The Zionist Union and Yesh Atid party, he said, were in need of some “soul searching” about why they opposed the law and about the exact clause to which they objected. 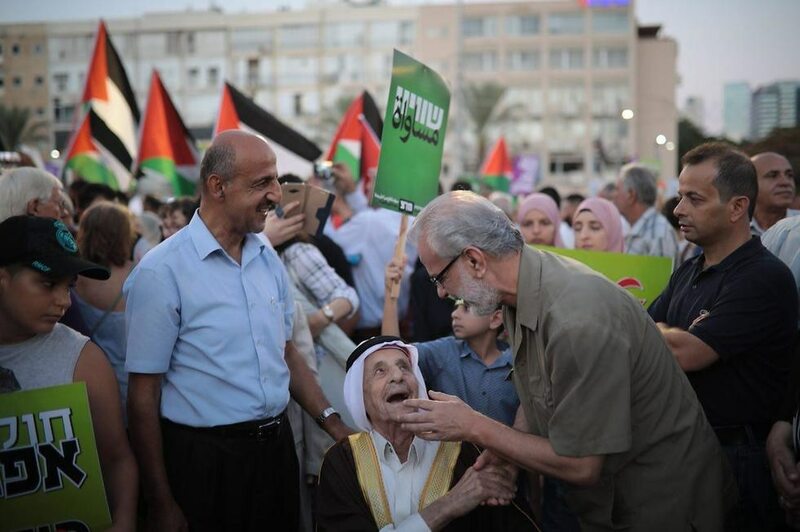 “Whoever was at the protest yesterday, without doubt, does not accept the State of Israel. MK Zouheir Bahloul, who is about to retire, said that the State of Israel is not his country. I expect minorities to recognize the State of Israel,” Cohen said. “It is the flag that they are trying to erase from history using the law, but it is the flag of a proud people,” Barakeh said at the rally on Saturday night. A former Druze MK and serving MK have stated their opposition to the waving of Palestinian flags at a mass demonstration held in Tel Aviv’s Rabin Square on Saturday night against the recently-passed Nationality Law. “We are against the waving of the Palestinian flag. I think that it’s unnecessary,” said former MK Shachiv Shnaan, whose son, Border Policeman Kamil Shnaan, was killed last year in a terror attack carried out on the Temple Mount in Jerusalem. “If you protest because you want equality in your country, why wave flags of another state?” he asked. “But it isn’t anything new that Arab Israelis have a continued identity problem. They are torn between the national Palestinian identity and their real lives in Israel in partnership with the state. “We waved two flags only: the Israeli flag and the Druze flag, which does not diminish our Israeliness,” Shnaan emphasized, drawing a distinction between the character of Saturday night's protest and that held by the Druze community last week. MK Saleh Saed (Zionist Union) also echoed Shachiv’s disapproval, telling Ynet that waving the Palestinian flag had no place at the protest. “That was unnecessary defiance that harms our justified campaign against the Nationality Law,” the Druze politician said. 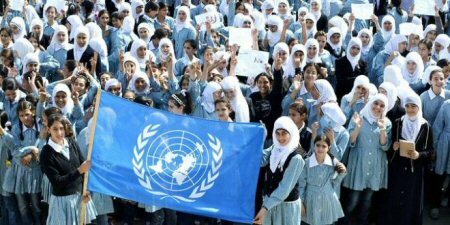 Amnon Be’eri Sulitzeanu, co-director-general of the Abraham Fund Initiatives—which works for a “shared future for Israel’s Jewish and Arab citizens”—noted, however, that no major negative impact was caused by the flags. “Despite the important decision by the follow-up committee not to wave national flags, Palestinian flags were nevertheless waved, and a few Israeli flags alongside them, and no disaster occurred,” Sulitzeanu said. “Just as the Israeli flag is the flag of Jews and is waved with pride by Jews in marches in different places in the world, it should also be acceptable to wave the Palestinian national flag by Arab Palestinian Israeli citizens, which is their flag,” he continued. “Many citizens, Jews and Arabs, who marched today in the streets of Tel Aviv against the Nationality Law proved that there is a willingness in Israel to adopt values and policies of shared lives and of equality for all citizens." Arab protesters voiced anger on Saturday evening at what they said was a poor turnout at the mass demonstration against the Nationality Law, stating that the rally should have attracted more than the tens of thousands of people who showed up. “This protest should be the opening shot of a wave of protests, including at the parliamentary, public and media level,” said Kamil Agbariyah, a resident of Jaffa who attended the protest. According to Agbariyah, the protest on its own will not suffice in overturning the law. “There’s no doubt that we will have to take many more steps, Arabs and Jews together. The campaign here is not about Arabs against Jews, but rather about equality and democracy. Palestinian flags fluttered in Tel Aviv Saturday evening as tens of thousands of Arabs and Israeli activists rallied in central Tel Aviv for the second time in two weeks in protest at the racist nation-state law, which was passed by the Knesset recently. The crowd marched from Rabin Square to Tel Aviv Museum, chanting slogans and carrying placards in Hebrew and Arabic condemning the law. 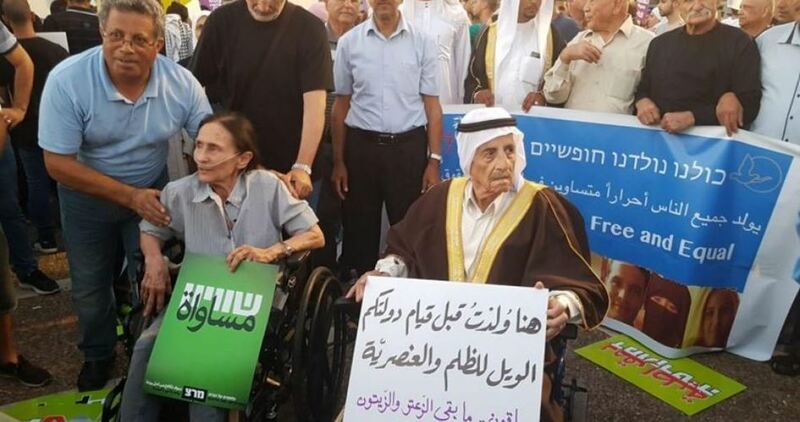 The protest was organized by the Higher Arab Monitoring Committee, a non-governmental organization that represents the native Arab community in Israel. 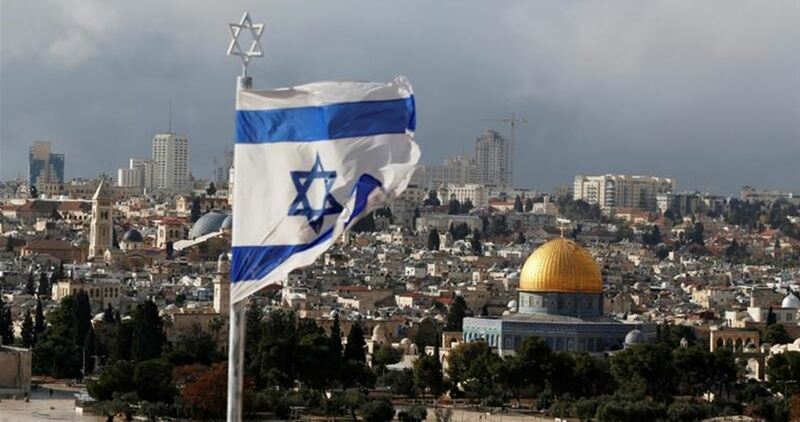 The Knesset passed last month a racist bill that officially defines Israel as the national homeland of the Jewish people and asserts that only Jews have the right of self-determination in the country (the 1948 occupied Palestinian territory). The racist law includes clauses stating that a "united Jerusalem" is the capital of Israel and that Hebrew is the country's official language. Another clause says that "the state sees the development of Jewish settlement as a national value and will act to encourage and promote its establishment and consolidation." The bill also strips Arabic of its designation as an official language alongside Hebrew, downgrading it to a "special status" that allows its continued use within Israeli institutions.